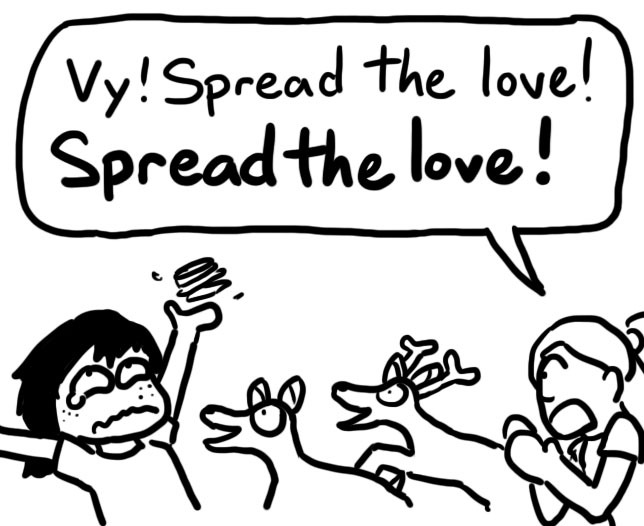 DO NOT FEED THE DEER. They will chase you down and eat your clothes. | I think in comics. DO NOT FEED THE DEER. They will chase you down and eat your clothes. For those who are interested– there are more photos on my tumblr! There’s this little city about an hour outside of Kyoto called Nara. 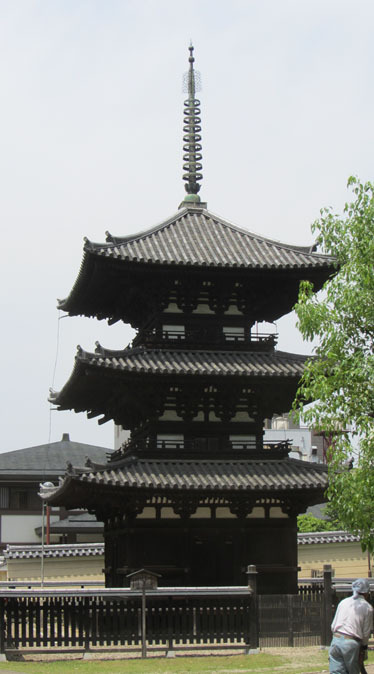 Nara is famous for its several temples, its numerous stone lanterns, and its countless deer. Deer, according to legend, are heavenly animals. They protect the people and the city of Nara. As a result, Nara residents have historically revered deer, and do not harm them. So the deer take advantage of it. Modern day Nara is swarmed with deer. Deer have grown accustomed to humans, since we feed and pet and don’t harm them. It’s gotten to the point where they’re a huge tourist attraction for both Japanese and non-Japanese alike. They were a tourist attraction for us, too. One day in Kyoto, we decided to escape to Nara instead. We hopped on a train to Nara, where our sensei had set up volunteer English tour guides to take us around the city. We started with the Sarusawa-ike pond, where captured fish is often released. 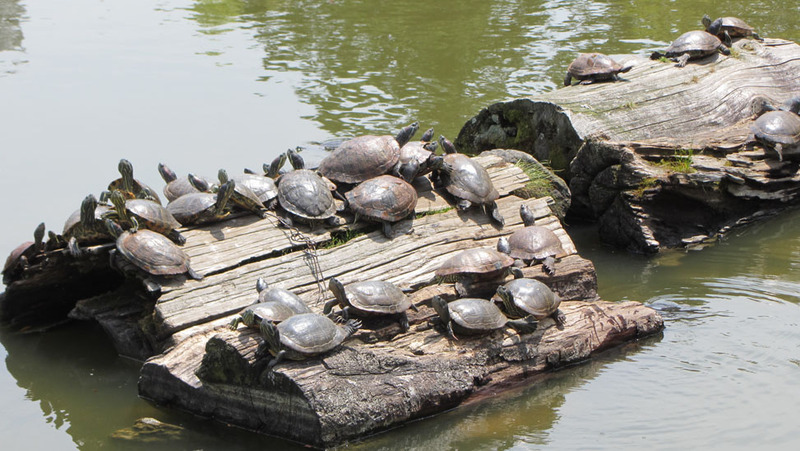 I saw more turtles than carp, though. And then we moved on to Kohfukuji, one of the many famous shrines in Nara. There are stands all over Nara selling senbei, crackers that tourists can feed the deer. Deer tend to hang around these stands. There was a stand at Kohfukuji, and thus a little patch of deer just chillin’. My first reaction was to scream. Second was to run up and pet them. If you have food, these deer will get it. They will chase you. They will push you. They will eat your clothes. 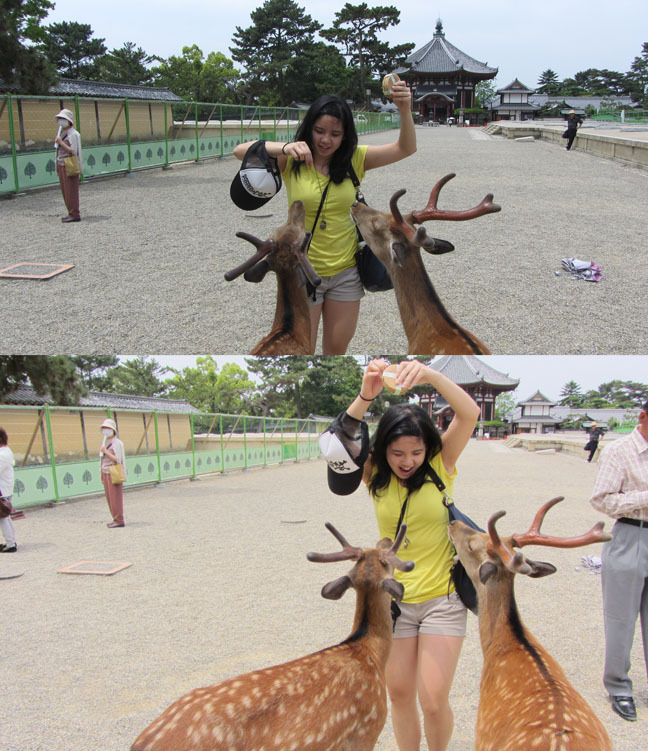 And I was thus harassed by deer in Nara. I quickly passed out the remainder of my senbei so the deer could go and bother other kids. I took a video, which I wish I could post—but here in Sapporo, I’ve been unable to connect my laptop to the internet. The old computer they have here is a bit too slow to handle youtube uploads. Perhaps when I get home. 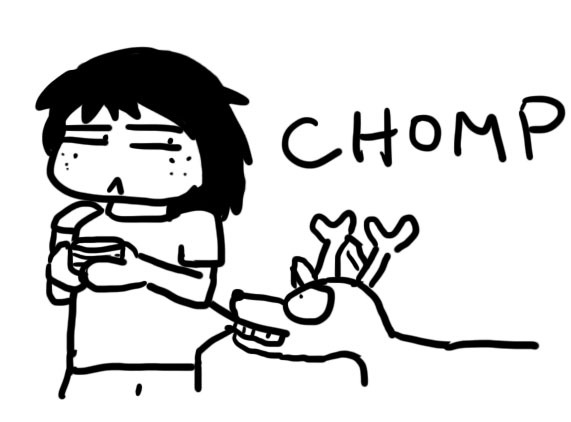 But I swear it’s true—the deer will bow to you to ask for food. 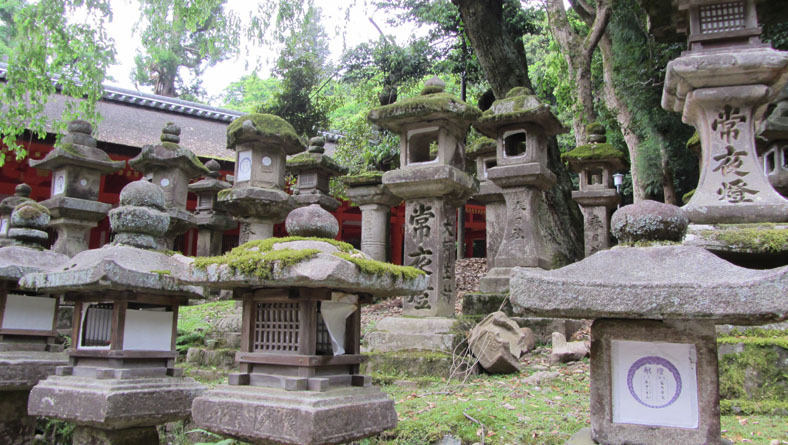 There’s also a forest path lined with hundreds of stone lanterns. During Obon, every single lantern is lit with candles. It was already quite a sight in the daytime. 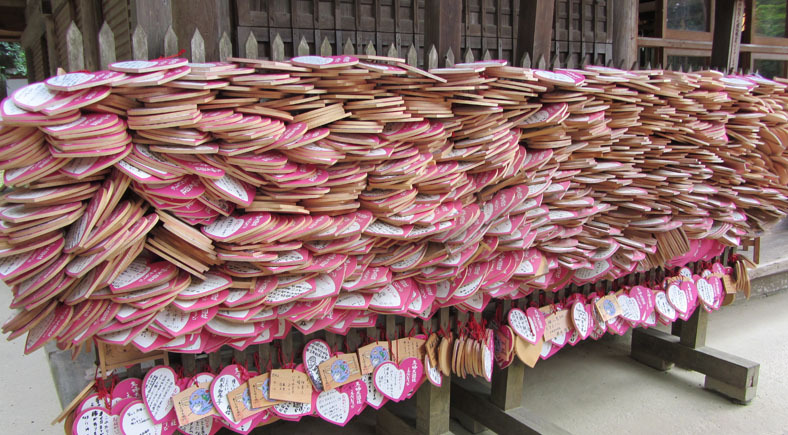 A big thing at temples is to purchase small wooden tablets on which you can write wishes to the shrine’s god. In Nara, perhaps because it’s swarmed by schoolkids, love wishes seemed to be popular. Very popular. So yes, Nara was pretty darn cool. I’ve never been anywhere like it—but I suppose that’s a common theme on this trip of mine. And on that note—please enjoy this plethora of deer photos! I am really enjoying reading about your adventures in Japan. You’re definitely making me think I should go and visit Nara again! I was there years ago and I completely agree that it’s a very special place, with lots of parkland, the Todaiji and of course the deer! 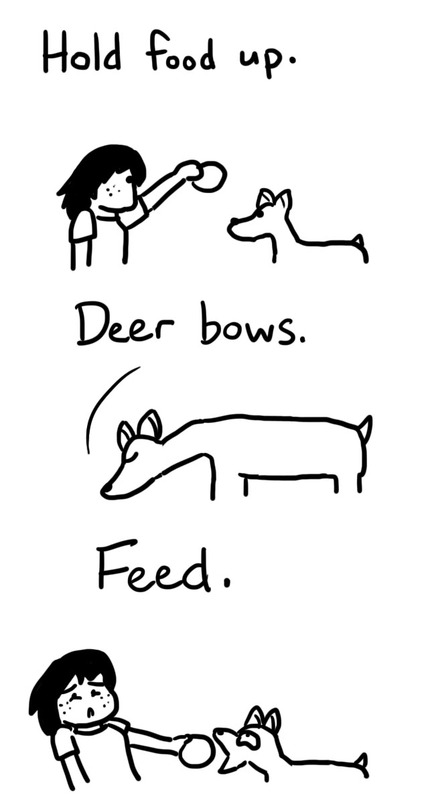 I can confirm that the deer really do bow. And that they are very pushy. One deer grabbed a map out of my pocket and had eaten half of it before I managed to recover it! It’s so true! In my group, about 5 kids had their maps eaten before they could even react. It’s such a unique and beautiful place, though… I already want to go back! And thank you so much for reading my blog! I’m glad you’re enjoying it. I’m assuming you’ve been to Japan before? 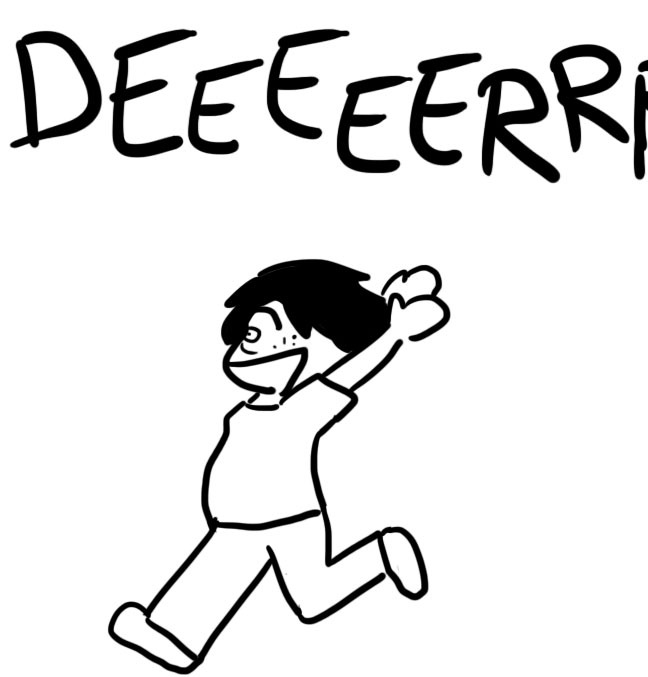 I really am enjoying your blog and your very entertaining writing style. Good writing and interesting material – it’s an unbeatable combination! I’ve visited Japan from Ireland about once a year for more than ten years, because my wife is Japanese. However this is my first time to live here (we arrived in March). After many years of learning the language and making very slow progress, I am now starting to feel the benefits of immersion. But I’m still pretty useless at speaking and understanding. I think the only secret to mastering Japanese is lots of time, and lots of patience. Japanese is absolutely, absolutely a difficult language to master. You’re not alone– we’re all having trouble as well! I am completely unable to understand native Japanese speakers; they talk so fast! And the grammar is so different from English. Immersion definitely helps, though. Being able to practice listening and speaking all the time, and really forcing yourself to practice, is so beneficial when learning a language. I’m sure that, living in Japan, you’ll reach fluency soon! That photo of the deer trying to nibble on your clothes–the pose you’re making in it–that belongs in a Beyonce video. Very attractive. 😉 I thought you said you couldn’t dance? Ha, ha, ha. Just kidding. Seriously, though, talk about something that could only be in Japan! I know, right? Every time somebody told me about Nara, I almost couldn’t believe it. And I DEFINITELY did not believe that they bowed. Now, I’m a believer! That’s a Monkees song, but most famously done by Smash Mouth and made super-famous by the Shrek movie (very good movie). Awww! I just…. akjdsksjdflsdkfksdfbh! All this cuteness… I can’t take it! I highly recommend Nara. The whole place is just soooo cute… so many little kids feeding the baby deer… AHHHHH TOO ADORABLE!! Vy, I can totally see all of this happening in my head. And if Alli, Angela, and I were there with you, we’d all be running and screaming with deer chasing after us. It’s awesome that you’re having so much fun ^_^ miss you though! 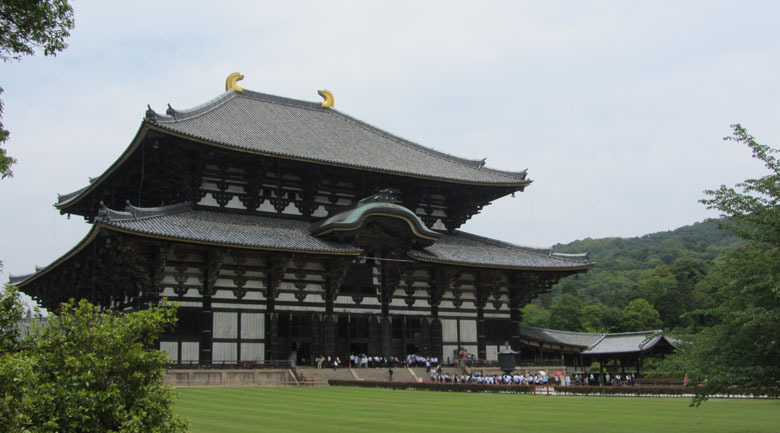 When I first looked at the Todaiji, I thought, “What? How is that the largest wooden structure in the world? And then I looked at the people! That place is enormous! And how did they stack those love wishes in such a way? It looks like it is about to fall apart. And stop putting up such cute pictures. I can’t stop looking at the deer! 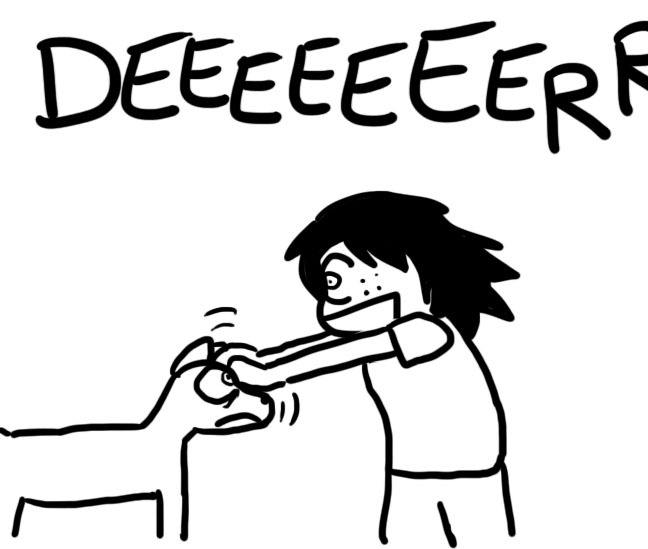 Still, a place where deer are hanging out with tourists; eating maps, clothes, and crackers; and you can go to pet them?! Sounds like a fantasy world. THE DEER! I couldn’t stop petting the deer. Though at times it got a little scary when they swarmed us!